So, it seems this year has seen one of the hottest summers on record… Despite at times we have had some very yellow looking grass, the rest of the garden has been blooming and we have had some bumper crops for everyone to share. The Summer has seen lots of activity at the garden and our highlight of the year so far was our fund-raising Music Day. Our 5th annual Music Day was another sell-out event, with over 500 people in attendance. We opened the gates at 2pm with live music and DJ’s, our famous homemade pizzas, botanical cocktails, our ‘Fill yer boots’ Ale & Cider bar, a ‘Pimp my Prosecco’ bar, amazing homemade vegan salad varieties made from our garden’s produce, Hilary’s homemade pies, sausage rolls and pork pies, vegetarian curry and of course, cake! The weather was glorious, the bands played for free and so many of our local community got involved to help us make it happen. We raised £5000 which will be used to do some groundworks at the garden, buy some new power tools and contribute to our next project, a caravan camera! Brendan Barry brought his Caravan Camera to the Music Day which was one of the coolest things ever! In a nutshell it’s exactly what it says it is… a caravan that has been transformed into a pinhole camera and dark room. Using the concept that you can make a camera out of anything, Brendan showed us that you can convert objects and environments into spaces capable of viewing and capturing a photographic image. 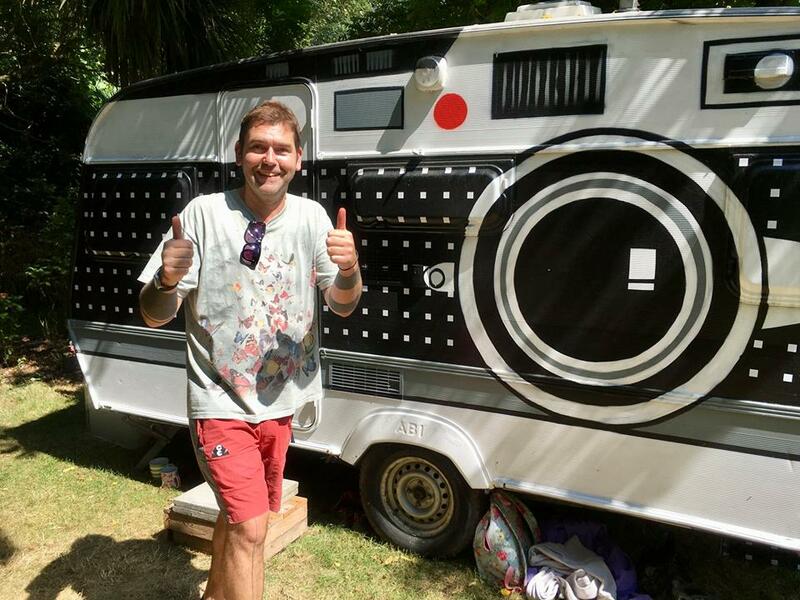 We followed the Music Day with a week of portraiture with our resident photographer Jason Evans and Brendan, supported by our regular attendees and we got some great shots… So next on our wish list is to convert an old caravan into a Caravan Camera, or a ‘CamVan’ as we like to call it. We were also very proud to be asked to join the National Garden’s Scheme this year and held an open day to benefit their charities that include MacMillan Cancer Support, Marie Curie and the MS Society to name a few. Lots of people came along who got to see one of our favourite blooms of the year, a beautiful Fire Lilly and we were able to raise over £400 for the NGS. The regular donations from Vegware help us host these amazing events on a small budget with the goodwill and help from our local community. This year we have continued to focus on becoming as sustainable as possible by using compostable and biodegradable products from Vegware to reduce our waste and plastics.